As the North & East start to fade into the distance, all roads going South converge at this timeless point. Dax, a city whose wide open sky welcomes its visitors after their long journey through the forest of the Landes. But this image is no substitute for the real sensations one experiences when meandering down the lanes of Dax at one's own rhythm. 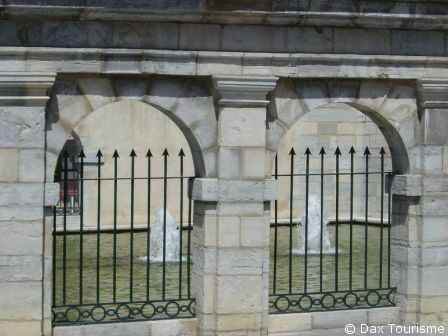 The roads of Dax, for reasons now known only to them, all unfailingly lead to the "Fontaine Chaude" constructed by the Romans. The Romans first cultivated the city, which they Christened "Aquae Tarbellicae" (a name derived from the name of the first tribe who settled in the region : The Tarbelles) and then "Aquae Augustae" (named after the daughter of Emperor Augustus of Rome, Julia Augustae, who's visit made the city and its beneficial springs famous throughout ancient Rome). The city remained loyal to its vocation as a spa town, despite those periods of profound sleep (from the 5th to the 12th centuries) following Barbarian invasions. A simple glance at the ramparts (largely destroyed during the last century, were build originally in the 4th century and later reconstructed in 1465 with 46 turrets and 4 gateways), makes it clear that the history of Dax (shortened to Acqs and later renamed Dacqs) was not always such a peaceful one. The city, as throughout the Aquitaine region, experienced three centuries of English rule (1152 - 1453, Alienor of Aquitaine through her marriage to Henry Plantagenet of England, gave Aquitaine to the English, this did not include the Pays Basque at the time), a somewhat strange period, when rulers offered wedding dowries of no less than a region of France! Time is the key for such a wealth of history to be truly understood. In the night light, one can sense the reassuring presence of the Adour, the river that has played an important role throughout the history of Dax. From the time of the Tarbelles, who built lake dwellings, right through to the exploitation today of the silt deposited along the "Barthes" (marshes) flood plains of the river, raw material of the Dax "Peloide" (mud with extremely rich properties for alleviating the pain of Rheumatoid Arthritis). Right up to the beginning of the century, Dax was a port, a port which witnessed the comings and goings of the flat bottomed boats (the "Galupes"), packed high with the wines of Chalosse, Tursan & Jurançon, barrels of Armagnac, resin, wax and timber from the Landes forest. All of this abundance was enough to irrigate the Pays Basque and the far away lands of England and the rest of Northern Europe.